When Michael Collins decides to become a surgeon, he is totally unprepared for the chaotic life of a resident at a major hospital. A natural overachiever, Collins' success, in college and medical school led to a surgical residency at one of the most respected medical centers in the world, the famed Mayo Clinic. But compared to his fellow residents Collins feels inadequate and unprepared. All too soon, the euphoria of beginning his career as an orthopedic resident gives way to the feeling he is a counterfeit, an imposter who has infiltrated a society of brilliant surgeons. This story of Collins' four-year surgical residency traces his rise from an eager but clueless first-year resident to accomplished Chief Resident in his final year. With unparalleled humor, he recounts the disparity between people's perceptions of a doctor's glamorous life and the real thing: a succession of run down cars that are towed to the junk yard, long weekends moonlighting at rural hospitals, a family that grows larger every year, and a laughable income. Collins' good nature helps him over some of the rough spots but cannot spare him the harsh reality of a doctor's life. Every day he is confronted with decisions that will change people's lives-or end them-forever. A young boy's leg is mangled by a tractor: risk the boy's life to save his leg, or amputate immediately? A woman diagnosed with bone cancer injures her hip: go through a painful hip operation even though she has only months to live? Like a jolt to the system, he is faced with the reality of suffering and death as he struggles to reconcile his idealism and aspiration to heal with the recognition of his own limitations and imperfections. 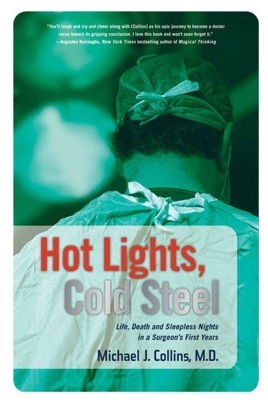 Unflinching and deeply engaging, Hot Lights, Cold Steel is a humane and passionate reminder that doctors are people too. This is a gripping memoir, at times devastating, others triumphant, but always compulsively readable. Collins begins this personal chronicle with an account of a choice he had to make between amputating a 14-year-old boy's leg and saving the limb at a greater risk to the boy's life. (He amputated the leg.) This dilemma came at the conclusion of Collins's grueling four years of residency at the Mayo Clinic, culminating in his appointment as chief resident in orthopedic surgery. Now in practice in Illinois, he details, with admirable humor and insight, the early, virtually sleepless years when he learned not only to perfect his craft but to come to terms with the emotional impact of causing pain and losing patients. Collins brings to life the dramatic moments when he made his first, terrifying incision and hand-drilled a traction pin into a weeping six-year-old's leg. Collins and his wife, Patti, wanted a large family, but the economic strain of having three children in three years (they eventually had 12) forced him to moonlight every other weekend at rural hospitals. There are moving passages about his love for Patti and the bonds he developed with other residents, and empathetic evocations of those he treats. 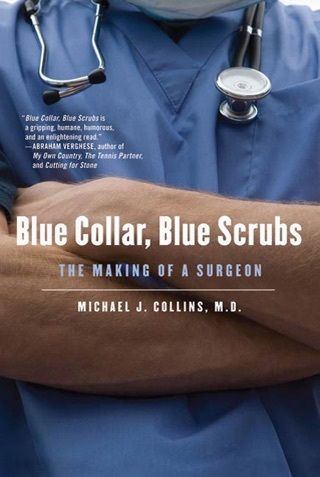 Collins describes powerfully how he came to understand that his calling was not just to develop as a skilled surgical technician, but to treat his patients humanely as individuals. As a pre med student I loved the refreshingly honest look into the world of residency. Not everything is perfect and glamorous in the medical field but it is worthwhile and that’s what what this memoir is all about.